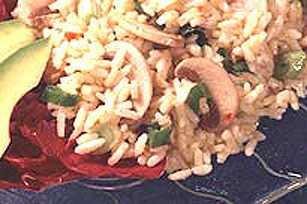 Mushrooms and curry powder add a culinary twist to this rice salad. The perfect make-ahead recipe, this Herbed Mushroom Rice Salad is great for potlucks and barbecues. COOL to room temperature. (To quickly cool the rice, spread in a shallow pan and freeze while preparing the remaining ingredients). COMBINE dressing and curry powder. TOSS with cooled rice, mushrooms and onions. SERVE with cold poached salmon, cold ham or chicken.